There are some subjects I seem to paint again and again. 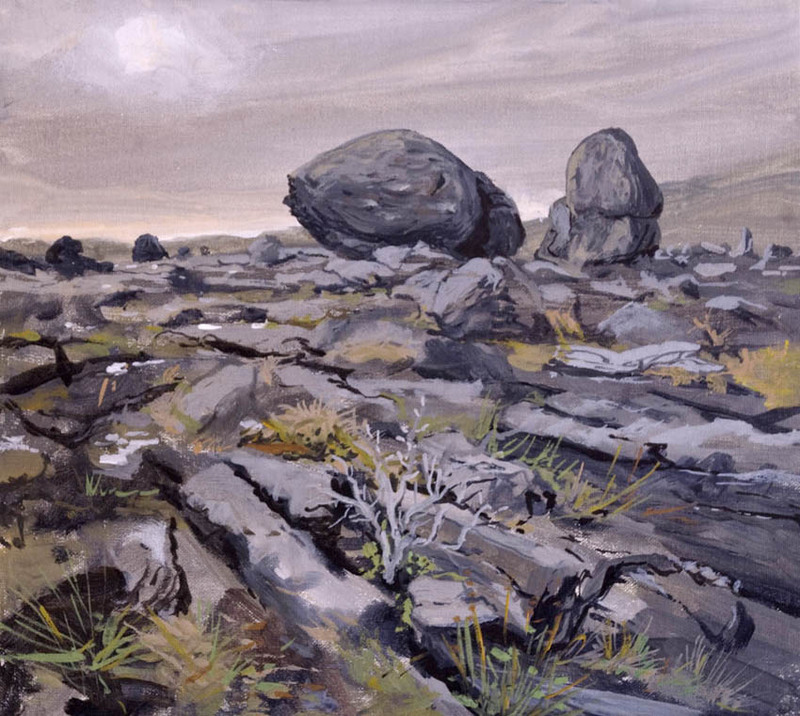 I have been a frequent visitor to the Burren in Co Clare in Ireland visiting friends of many years standing. The area is all limestone with huge areas of paving, making a landscape that is often otherworldly and bleak, but also very beautiful. 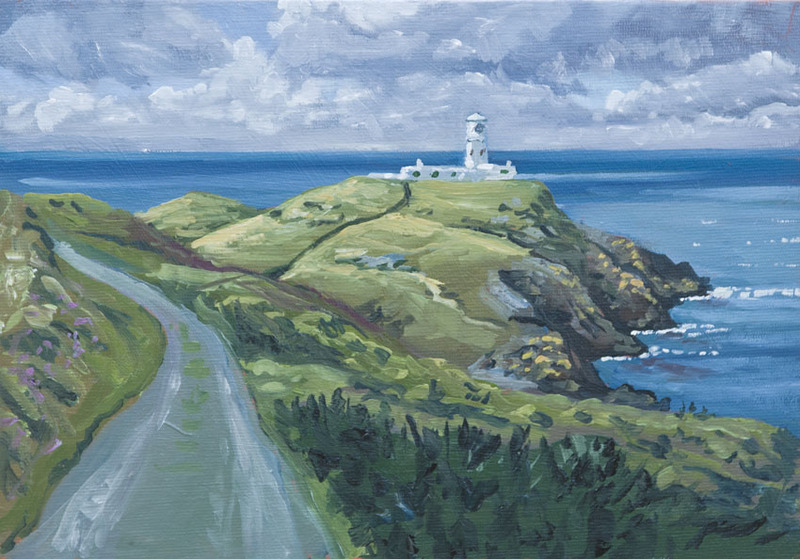 I have painted this landscape many times and have found it extremely difficult to capture to my satisfaction. The many cracks in the rock called “grikes” give the ground surface a riven shattered look. Each of the fissures though carries a rich and varied population of plants that run from gentians to orchids. In winter the colours are mainly muted but with glints of rich reds. Here’s one of the first times I caught something of the character, painted as I recall on a bitterly cold December day. The large rocks are called erratics and are left behind by the melting of the glaciers that carried them to their current resting place. 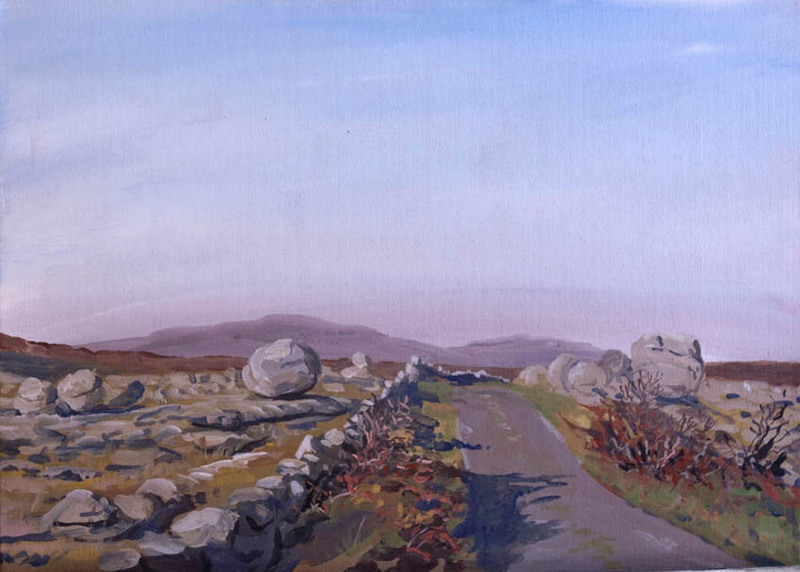 Here is another view of the same rocks done at a similar time, the road running through the stony landscape became a composition I have painted in many different moods. It is at it’s best early or late in the day with the low winter sun raking the light over the limestone paving. 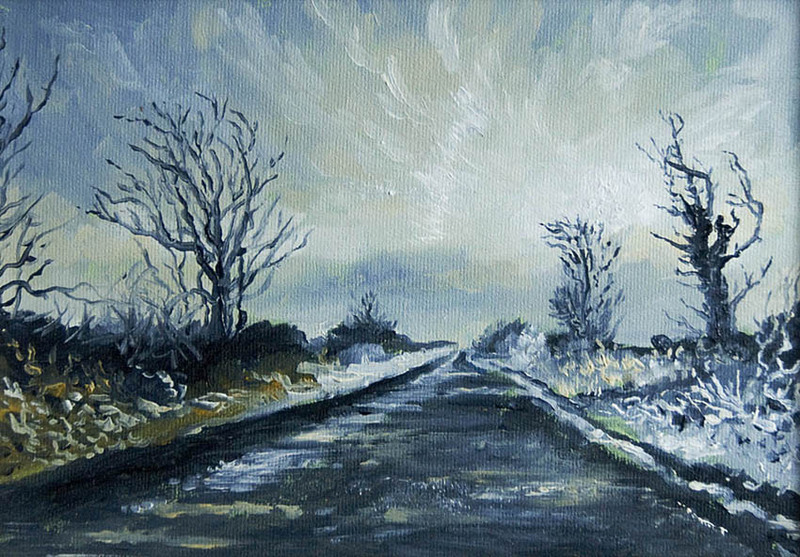 Here’s the same empty road painted very late on an extremely cold day. The light is often fantastic just after the sun has set, the only problem being that you have only moments before the light goes over completely and it becomes too dark to see your palette. The previous painting and the one after this were all painted on consecutive days. Which shows just how much the mood could change. The sunlight here was beautiful and the air crystal clear, but those lakes are iced over and my car reported -4 centigrade and my feet agreed. The ice had melted over night and refrozen to become so slippery that no traffic could get down the road. I slipped and slithered on foot and painted this sitting in the middle of the road. It is amazing how when you are concentrating hard on painting you stay relatively warm. I am sure if I just sat in the road doing nothing in particular with the thermometer at four below I would have been frozen stiff. Yet another lonely road, the theme of this post really. 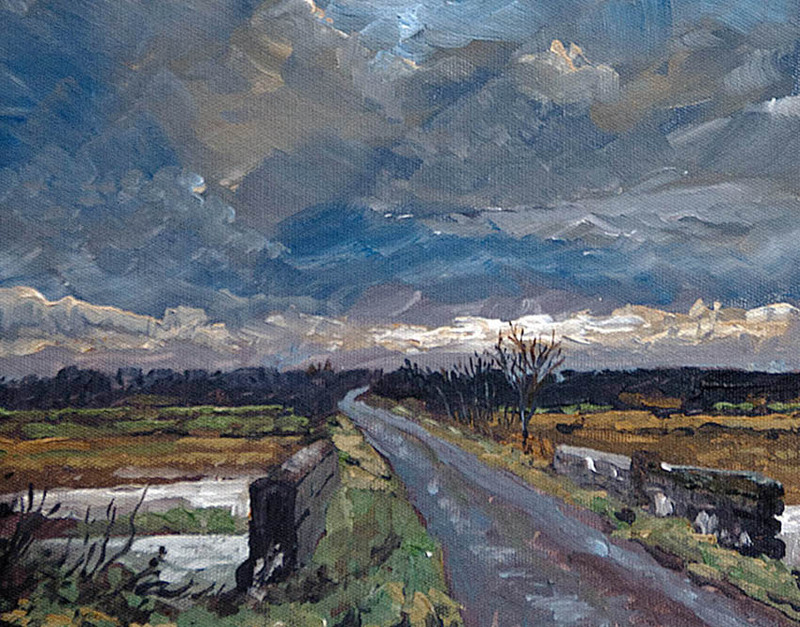 This is the road to Ruan, a very ancient causeway across a bog. Men have been passing along this way for thousands of years. A very wet day, I had only a few moments to catch the way the line of light on the horizon brought the scene to life. 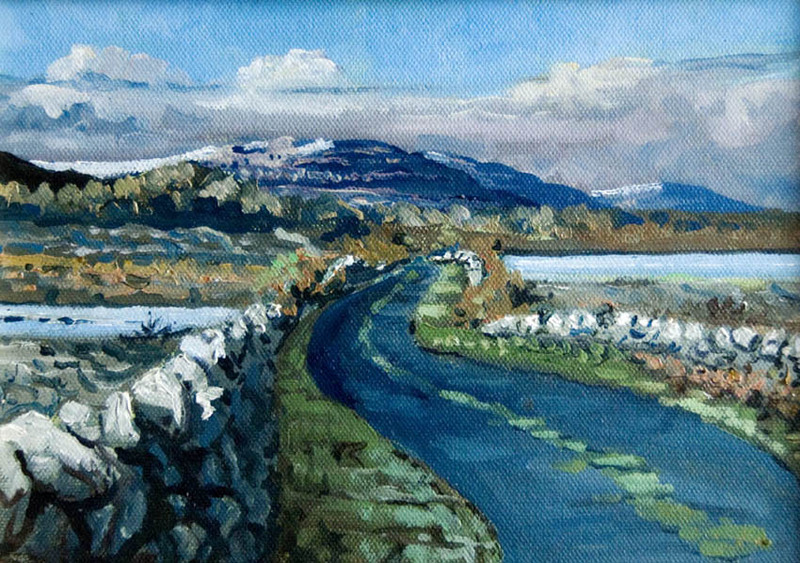 Quite a few years ago we had a rare snowy day on the Burren, I took quite a few photos that were nice enough but nothing to base a painting on but this came from one I had hopelessly out of focus and under exposed. I found it while sorting through old files and brightened it in photoshop, somehow it had something that fitted well with my memory of the day. I’ve linked the image above to a larger version. My first purely painting expedition of the year. I find alas that it is hard to get down to painting when in company. Painting is a selfish activity, best carried out in solitude. Also very few people want to sit in the rain for an hour in an uncomfortable corner of a field! I’m based in Newport Pembrokeshire staying at my sister in law Judy’s bungalow which sits high above the bay. 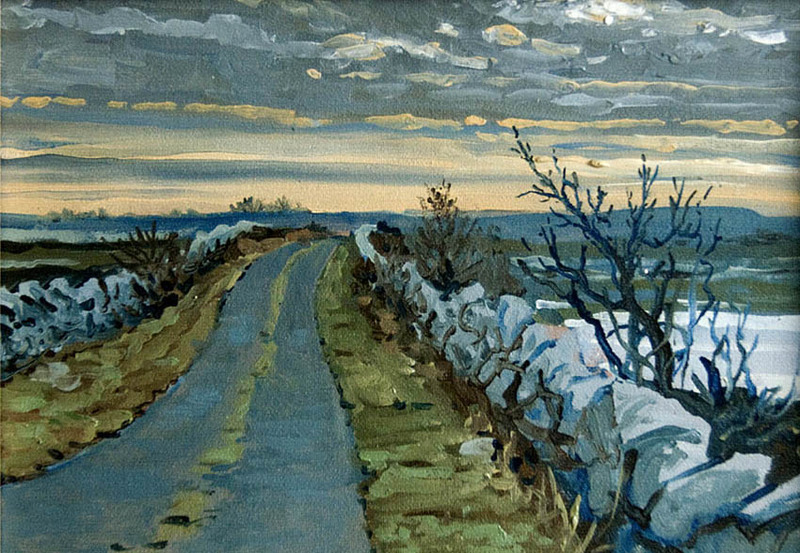 I often find it very hard to settle down to a scene and paint and often drive and walk for many hours before settling on a subject. The early morning and late evening are always good but I like the challenge of making a picture out of unpromising light or difficult conditions. Once you start there are always unexpected beauties that you discover as you work and hopefully these make the result worthwhile. 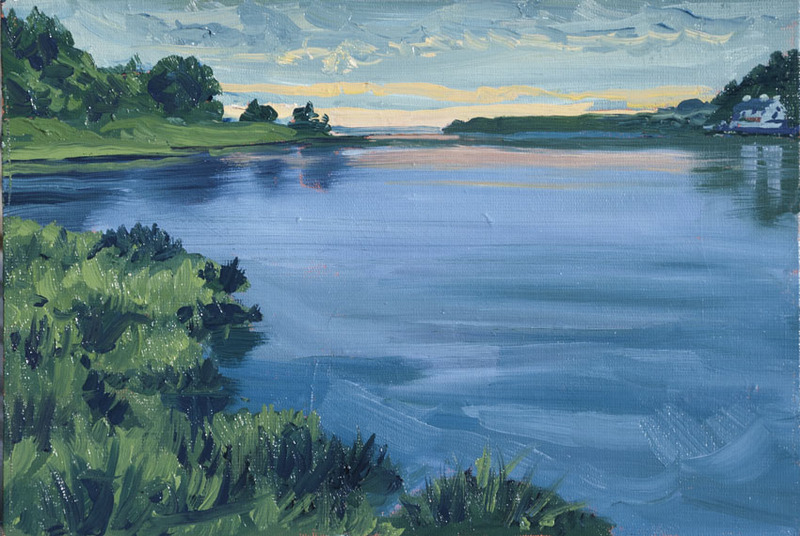 This was painted at the end of a very grey day, suddenly at 9.30 in the evening the light improved so I went down to the sea try to and catch the mood. I had to settle very quickly as I only had about half an hour of light… and the rain started as soon as my easel was set up. 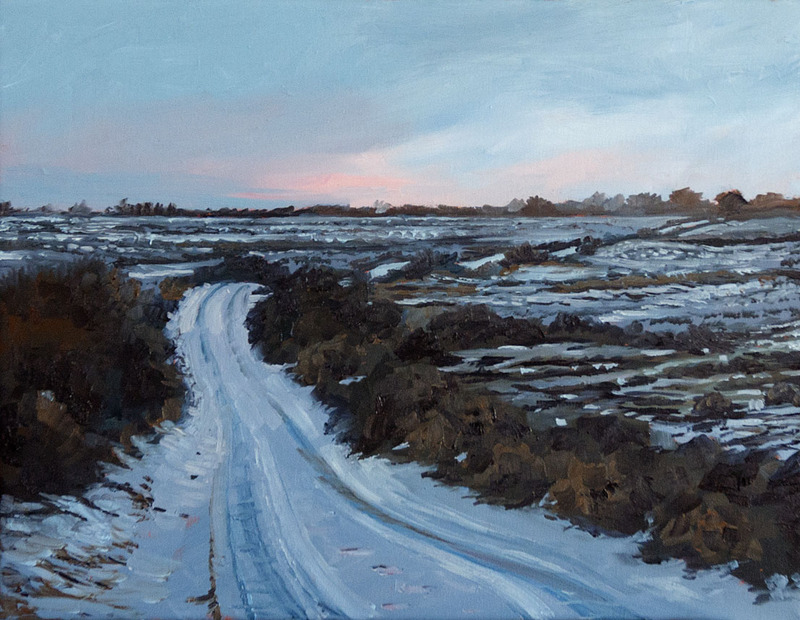 In conditions like that I try to deal with each area in turn finishing in a single pass, but being very careful to get the values as right as I can, though when the light is fading so fast these can be very hard to judge. Most of the day spent walking with friends. I did stop to do a quick water colour from this spot but it all went horribly wrong so when the evening light became beautiful at the very end of the day I rushed out to get my revenge! This was done at 10pm and I only really had 15 minutes, the colour of the water was amazing and if anything I have toned it down. I tried to keep the brush work fluid and put in only enough to suggest forms. I have to report that Welsh mosquitos laugh in the face of “Jungle Formula” and the light had so far gone by the time I had finished that navigating the marsh loaded down with painting gear was distinctly tricky. 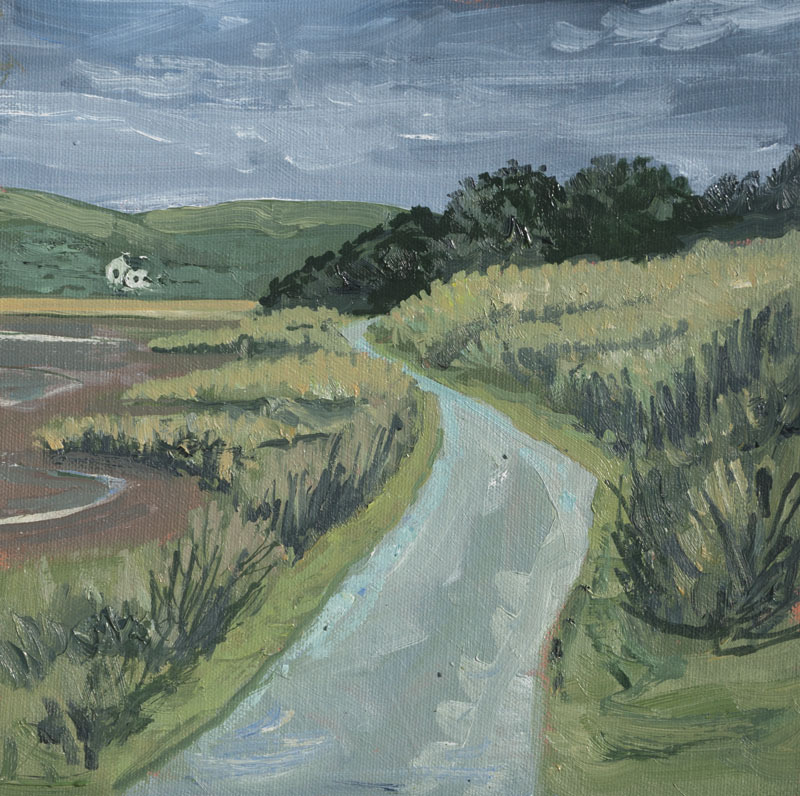 My first full day painting, I decided to paint inland as the light was quite flat and hazy. I went to Nevern a small village that is named after the river running through it. I decided to take a path that the map showed followed the river, but before I had hardly started I came across this fine tree which had lovely strong tones. I tried to get the balance of detail to focus on the tree, dealing with the background shrubbery in a fairly cursory way. After a fair bit of up hill and down dale I reached the river. A fallen tree had tumbled into the Nevern and it allowed me to sit almost almost mid stream. I just worked with my pochade box on my knees. 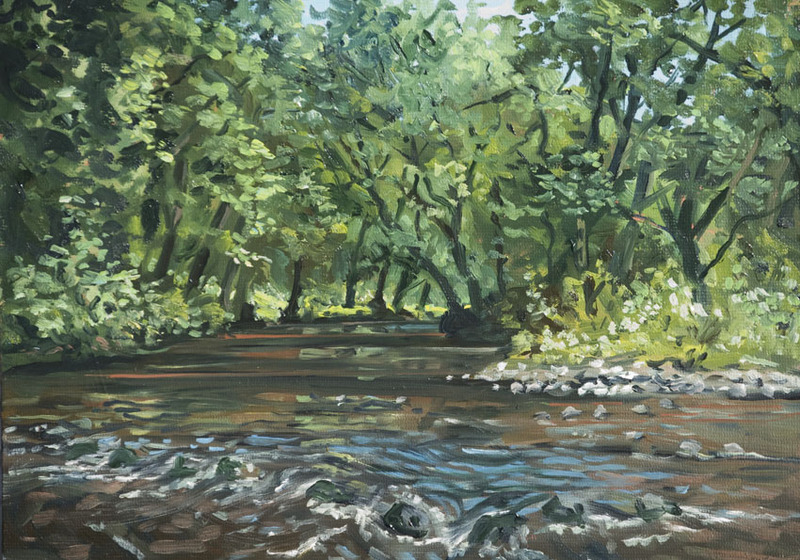 River scenes like this are very tricky to sketch as the detail is almost overwhelming. Sure enough I was soon battling against putting too much into the trees, painting like fury when the sun came out as it was only then the scene came to life. Wooded subjects like this are often good in middle of the day light when other scenes would be too flat to be interesting. After 45 min I called a halt as I was in grave danger of tumbling off my perch into the flood. The path followed the river for short distances then climbed up steeply before dropping down, I had covered about 7 miles and my pack which weighs nearly 23 lbs was getting heavy. I was pleased to find this scene which made a better composition than the last one. 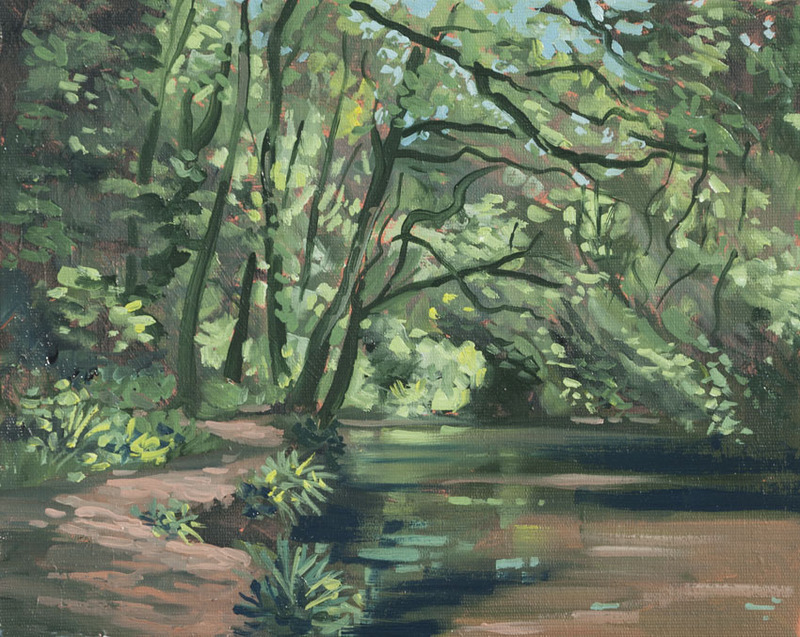 I try not to force plein air sketches into a formal composition, that’s better done in a studio panting I feel, so I just try and get it down as simply and honestly as I can. Here I made a conscious effort to simplify the blizzard of foliage and pull out the broad areas of light. This requires a lot of squinting that makes passers by think you are mad as a herring. A visit to Tenby on a scorcher of a day. 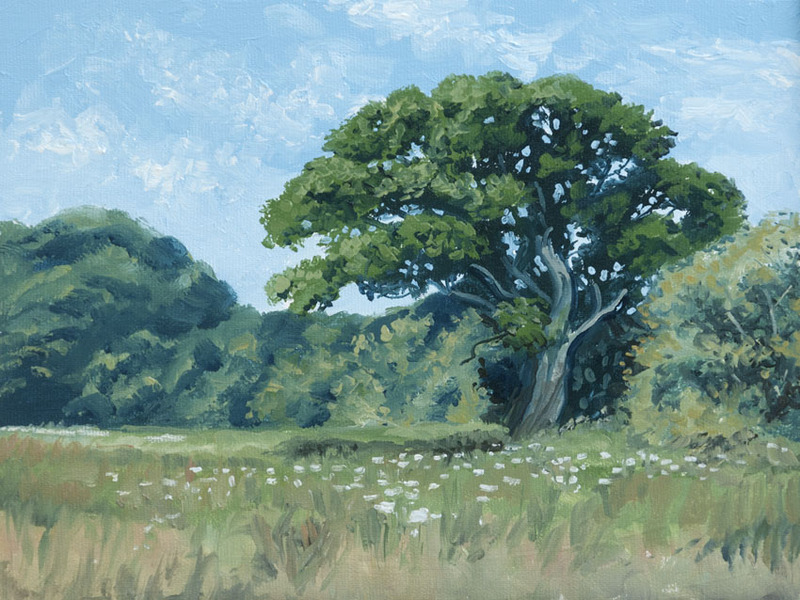 I often find it hard to find subjects I like in beautiful sunny weather, but after a pleasant wander round the town I settled down to paint this. I did it on a slightly larger board, usually I use 10in by 7 or 8 but this was twice that. Getting the tones of the town high above the harbour was distinctly tricky, in reality as the day was very clear the darks were nearly as strong as in the fishing boats but I wanted the boats to stand forward but not too much. The foreground was great to paint with lovely textures and values. I had to resist putting too much in. An insatiable desire for ice cream decided it was finished, but very few paintings were ever ruined by stopping early. 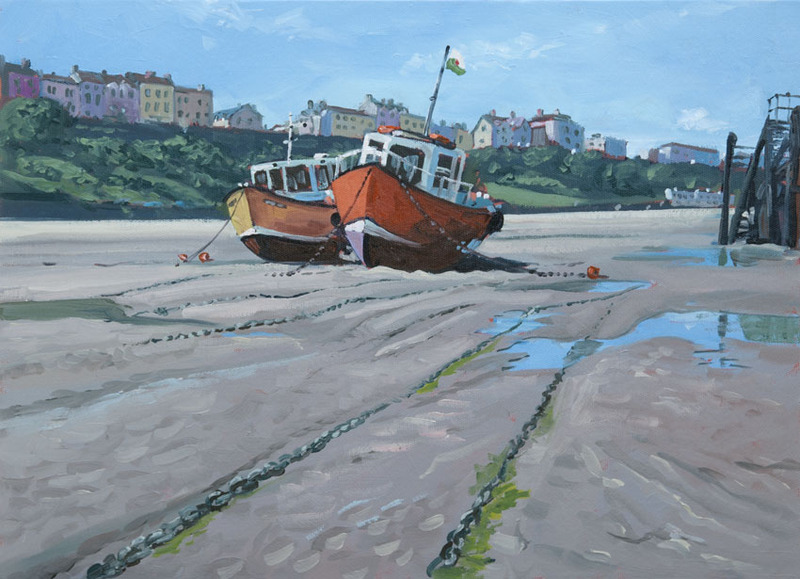 After painting in Tenby I decided to explore the coast path a bit. I took watercolours only as I didn’t feel like hauling the full kit. 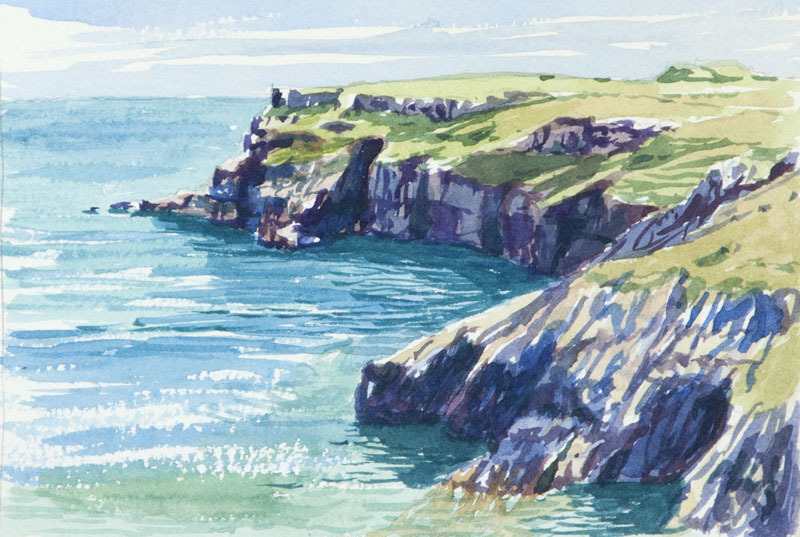 The Pembrokeshire coast path is always a delight and I could have done a dozen paintings with each new vista open up worthy of a paint. I settled on this view of St Govan’s head. I’ve been rather neglecting watercolours of late but they are marvellous for catching the brilliant light, the photos I took don’t capture the scene half as well. Alas my little water jar of 20 years use, escaped and rolled off the cliff, now I will have to buy some overpriced condiment in order to get another jar of the right size! A determinedly wet day of unremitting rain made painting unlikely, but when out shopping in Cardigan the veiw from the Supermarket car park took my eye. It’s often the case that the most unpromising of days throws up the best subject and these subtle tones and beautiful reflections just cried out to be painted. I got very very wet mind you. I left out half the boats to reinforce the feeling of calmness. Another grand day, the met office seemed determined that it was going to pour down all day, but it was mostly bright with the sun and the clouds conspiring to shadow and light up the landscape in wonderful ways. This is Strumble Head near Fishguard. The wind was pretty fierce so I had to hang a rock from the easel to stop it being blown away. 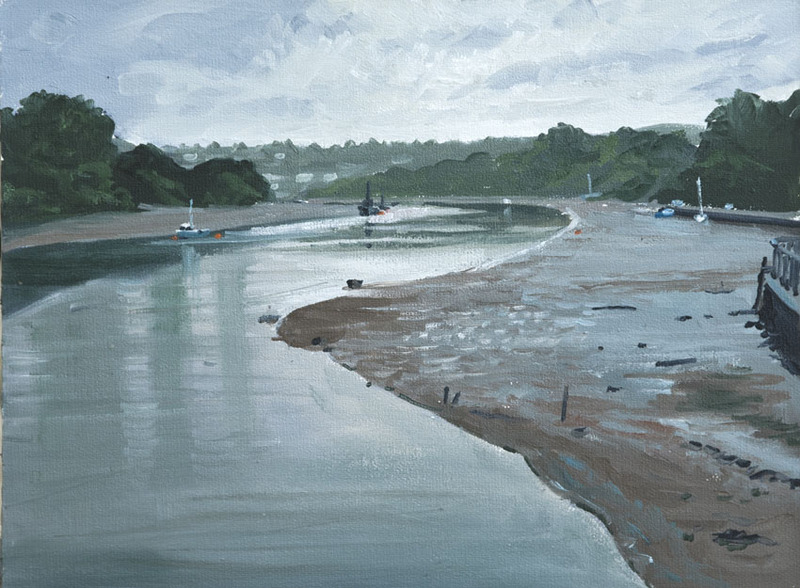 After doing this I walked on along the coast path with just my camera, the changes of light were just too fast to paint, but I got material that will make for a few studio based paintings on my walk.